The Giro Axis™ frameless design features an elegant new quick-change lens system and clean, bold style. Four self-locating magnets assist in lightning-fast lens replacement and four snap pins keep the lens securely locked in place. The medium fit accommodates a wide range of face shapes while boasting an impressively wide EXV field of view. The Giro Axis™ frameless design features an elegant new quick-change lens system and clean, bold style. Four self-locating magnets assist in lightning-fast lens replacement and four snap pins keep the lens securely locked in place. The medium fit accommodates a wide range of face shapes while boasting an impressively wide EXV field of view. The Axis includes two of the best lenses in the business with premium VIVID™ lenses with Optics by ZEISS (one sun/ all-conditions lens and one Infrared storm/low-light lens). While EVAK™ Vent Technology and anti-fog coating keep moisture in check. The Axis is ready for all aspects, conditions and every element. 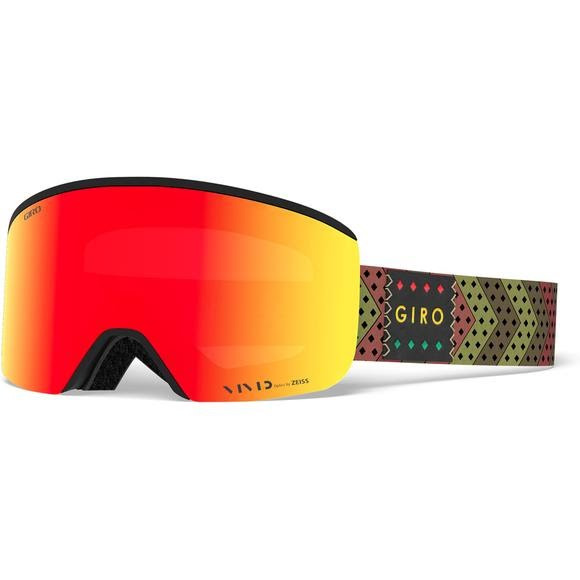 VIVID™ is a patented lens technology developed by Giro in partnership with ZEISS Optics that improves the visual experience on snow by enhancing contrast and definition. VIVID reduces eyestrain, improves reaction time, boosts confidence and delivers precise vision without color over saturation. Injection molding a cylindrical lens helps refine optics and minimize distortion that can occur subtly in thermo formed cylindrical lenses. Giro offers a full range of performance-engineered lens tints and mirror coatings that help to enhance your vision and every lens is protected by a durable hard coating that resists scratches.